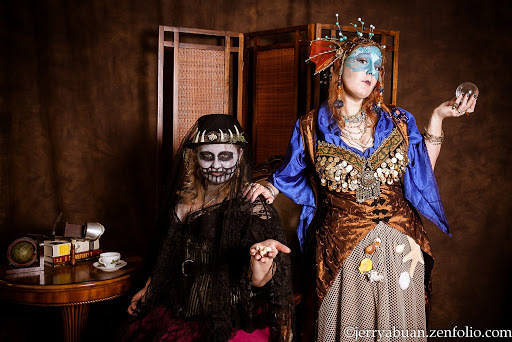 Traveling the Seven Seas… the reason I actually dressed like a fish. Photo by No Blondes! Photography. Mama and her pet fish. We’re still trying to think up proper names for these ladies. As is my usual, cheapo way, I am a huge fan of recycling costume pieces. So fish lady is made up of older pieces I made/collected. The vest is my ghwazee I made for last years Gaslight, I simply pinned back the front skirts. The netting was given to me by a friend. Its actually just pinned and tucked around my waist, the shells and such glued onto the front. Yup, still getting mega mileage out of that coin bra I made. 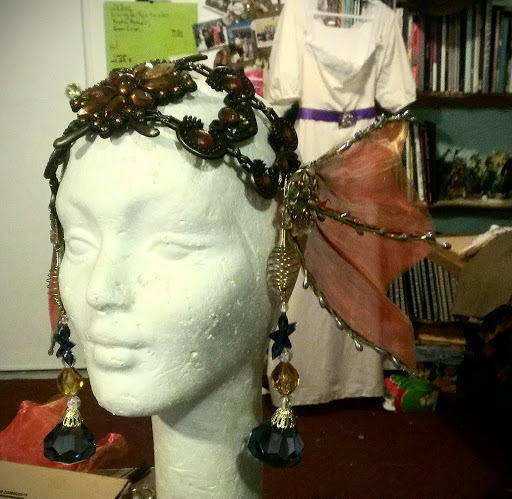 Most of my effort went into the headdress, which I really had fun making. Close up in progress shot. 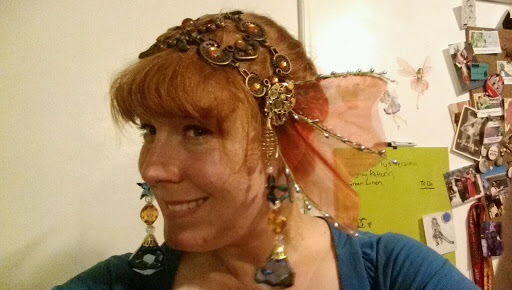 If you’ve been following my blog for a while now, you probably will recognize the base of this headdress… because I’ve used it many times before in my costumes. What can I say? I’m a one trick pony who loves using this base. Its very versatile. I made the webbed ears and the large crystals are from the center pieces from my wedding. A shot of the pearl halo fixed to my head. 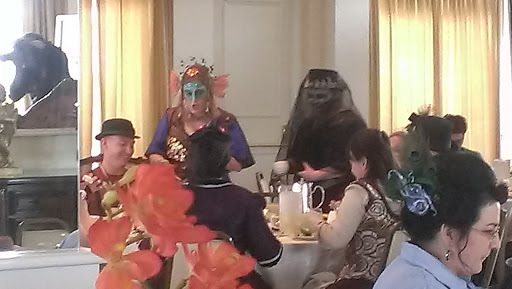 Sea Hags workin’ hard for the money… actually scones. We worked for scones mostly. Usually I tend to shy away from extensive make up. Body paint makes my face itch and I end up tracking it everywhere. But since I had be a fish this year, I figured it was a good idea to paint my face. I used water soluble face paints and added the rhinestones to my forehead with spirit gum. It was a long process but it looked great when it was finished. I gave myself purple Cupid’s bow lips, unfortunately they faded half way through the day. I’ll work on a more permanent lip treatment next time. Overall, I’m very pleased with how this turned out. I was on a mega tight budget and I managed to put together something pretty fabulous on a dime or two. 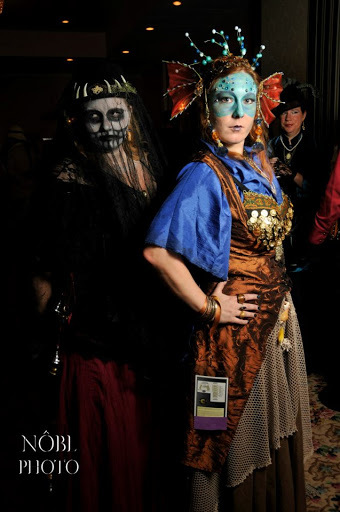 Ace and I plan on wearing these costumes again for Labyrinth Ball on Friday night. I’ll be doing some detailing on it all (distressing the netting and shirt, making a new skirt to read more like a fish tail and in brighter colors, etc. etc) So stay tuned for fish lady 2.0 coming in July! 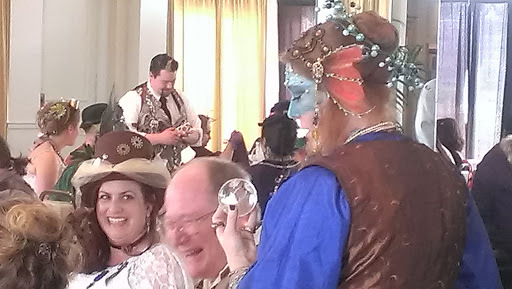 And of course, since it was a steampunk con, I had to wear my Annabelle Leigh Langy outfit. 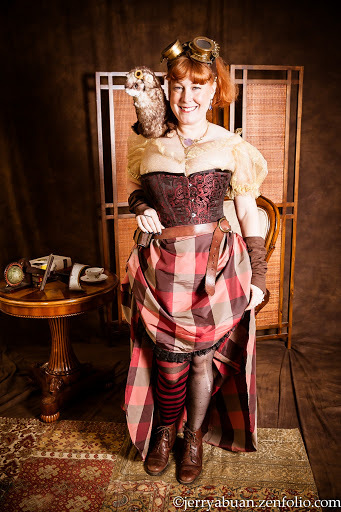 This lady has been getting lots of costume mileage and I’m happy to now be known as “the ferret lady” when I step out at various steampunk events. 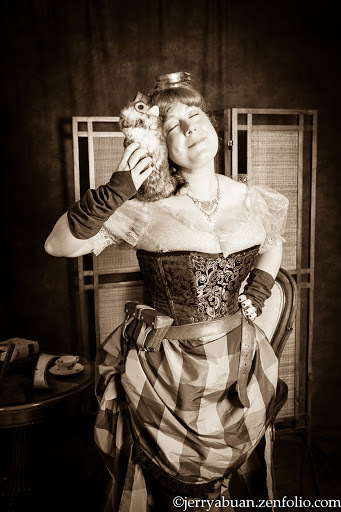 Jerry Abuaun took a great photo of me and Senor Squeaky-Pants. Thank you, Jerry! Everyone loves a steampunk ferret! Now that summer is gearing up (No pun intended with this post) so is my costume/garb making. Be prepared for my LoJ siren costume, some middle eastern garb I’ve been working on, and progress on a Game of Thrones SCA themed project myself and other costumers in my kingdom are working on. 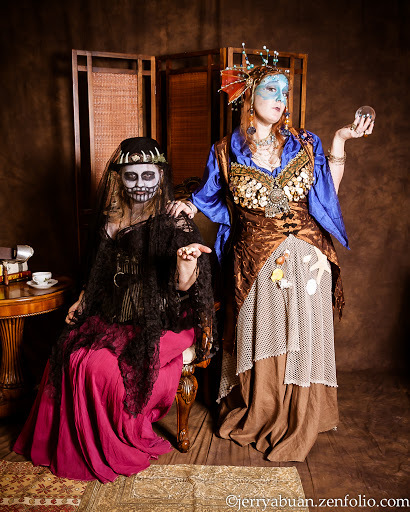 Labyrinth Ball 2013: Finished Siren Maiden and other fun! 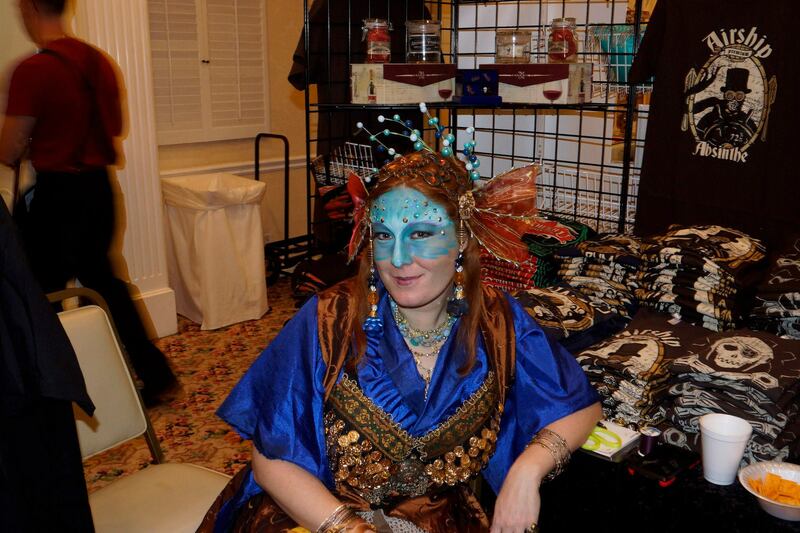 Labyrinth Ball 2013: Siren Maiden.